Well, I’m back from my holiday and after all the light books I read while basking in the sun, I am definitely ready for some weightier material. I’m looking forward to starting on the books I picked up earlier this month but wasn’t able to bring with me on my travels (The Past is Myself, Cairo in the War, etc) and also these new books which were waiting for me at the library when I returned. I start my new job next Tuesday so hope to get lots of reading in before then. Letters from London by Julian Barnes – Following in the footsteps of Mollie Panter-Downes, Barnes spent five years during the 1990s writing the “Letter from London” for the New Yorker. I’ve read this collection of his columns before but, since reading Panter-Downes’ London War Notes, I’ve wanted to try this again. 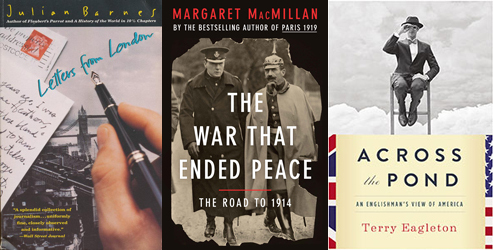 The War That Ended Peace by Margaret MacMillan – Love MacMillan. Across the Pond by Terry Eagleton – I can never resist any book by an outsider experiencing a foreign culture, especially when the nations being contrasted are America and England. Come to the Edge by Joanna Kavenna – Cassandra White is a woman on a mission. Her Lakeland farm may be falling apart, but at least she’s escaped the madness of modern life. But when her valley is invaded by bankers buying up second homes, she’s determined to put up a fight. What begins as a hare-brained scheme with a few unruly locals soon has the whole community taking up arms—and, before she knows it, Cassandra’s leading a revolution. 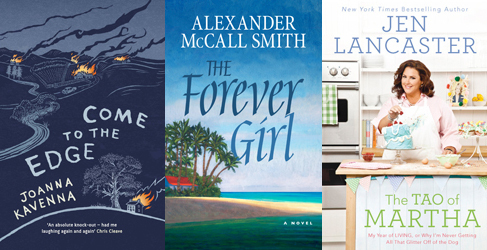 The Forever Girl by Alexander McCall Smith – this was an eBook hold that came available while I was on holiday. Forgettable but with enough of AMS’ characteristic musings to make it worthwhile. The Tao of Martha by Jen Lancaster – Loved this. Another eBook hold that I read on holiday, this is Lancaster’s self-improvement memoir of spending one year doing her best to live according to the dictates of Martha Stewart. I have The Forever Girl out from the library at the moment! Enjoy your loot! Letters from :London and Across the Pond caught my eye. They both sound very good. I took out Americanah by Chimamanda Ngozi Adichie and The Killing by Hewson, David. Really looking forward to both of them Adichie is one of my ultime faourite writers and I have a passion for Scandinavian Crime Novels. These are all new to me! I hope you enjoy them. 🙂 Happy Reading! I read ‘The War That Ended Peace’ not long ago and really enjoyed it. It was my first time reading MacMillan, and she was delightfully readable! Isn’t she great? I think my favourite of her books is still Women of the Raj. Letters from London and The War that Ended Peace look great! Don’t they just? I can’t wait to get started on them.